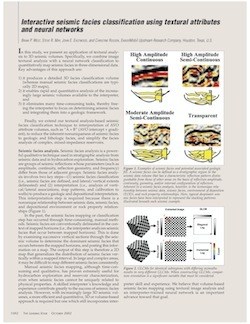 I read Brian West's paper on seismic facies a shade over ten years ago (West et al., 2002, right). It's a very nice story of automatic facies classification in seismic — in a deep-water setting, presumably in the Gulf of Mexico. I have re-read it, and handed it to others, countless times. Ever since, for over a decade, I've wanted to be able to reproduce this workflow. 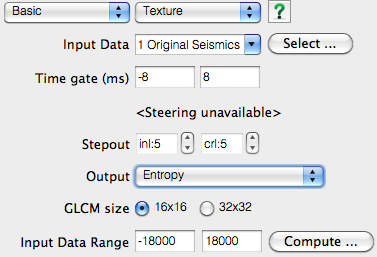 It's one of the frustrations of the non-programming geophysicist that such reproduction is so hard (or expensive!). So hard that you may never quite manage it. Indeed, it took until this year, when Evan implemented the workflow in MATLAB, for a geothermal project. Phew! But now we're moving to SciPy for our scientific programming, so Evan was looking at building the workflow again... until Paul de Groot told me he was building texture attributes into OpendTect, dGB's awesome, free, open source seismic interpretation tool. And this morning, the news came: OpendTect 4.4.0e is out, and it has Haralick textures! Happy Christmas, indeed. Thank you, dGB. There are 4 parameters to set, other than selecting an attribute. Choose a time gate and a kernel size, and the number of grey levels to reduce the image to (either 16 or 32 — more options might be nice here). You also have to choose the dynamic range of the data — don't go too wide with only 16 grey levels, or you'll throw almost all your data into one or two levels. Only the time gate and kernel size affect the run time substantially, and you'll want them to be big enough to capture your textures. The seismic dataest is the F3 offshore Netherlands volume from the Open Seismic Repository, licensed CC-BY-SA. It turns out there are a couple of bugs in this early implementation (thanks Paul and Raman at dGB!). It doesn't run on timeslices, and you can't write the volume out to disk yet. But dGB has a rapid development cycle and gets new stuff out quickly via the new installation manager, so we'll continue playing with it and exploring the parameters. In the meantime, there are always workarounds!